Darien goal keeper Aaron Sears in action during a Class LL playoff game against Staples in Westport, Conn. on Tuesday, Nov. 6, 2018. 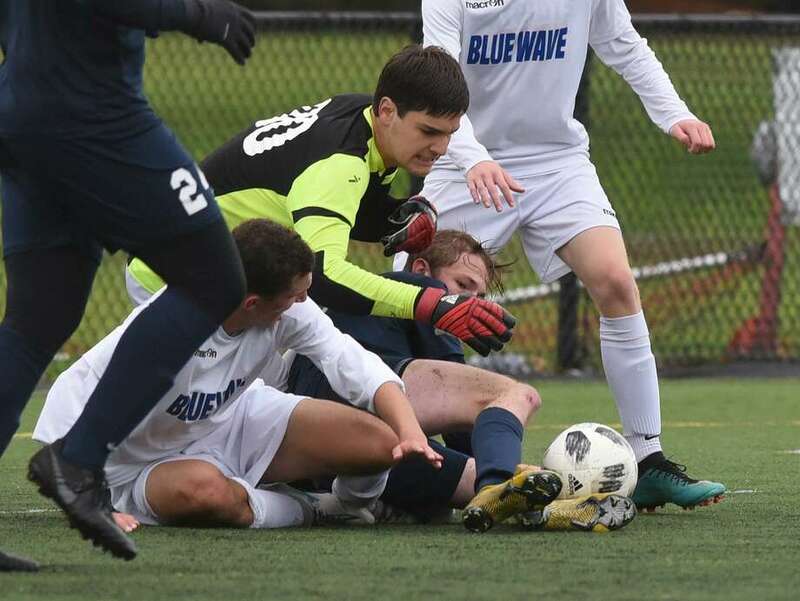 WESTPORT — The Staples Wreckers and Darien Blue Wave boys soccer teams have played 180 minutes in two games this season without determining a winner. In the end, the difference between the FCIAC foes was one penalty kick. Staples survived by the slimmest of margins and will advance after defeating Darien 5-4 in PKs in the first round of the CIAC Class LL tournament Tuesday at Wakeman Field in Westport. Each team scored once during the second half of regulation and the game ended in a 1-1 tie after 100 minutes. No. 10 Staples (12-3-4) will now go on the road to take on the No. 7 Cheshire Rams (11-2-3) in the Class LL second round at 2 p.m. on Thursday. Cheshire edged EO Smith 2-1 in overtime on Tuesday. The Wave (7-5-5) and Wreckers engaged in a physical battle, which was basically a continuation of their regular-season clash that ended in a scoreless tie. The Wave had a slight advantage early, testing the Staples defense which featured goalie Ry Cohen (5 saves) and backs Nick Ambrose, Gabe Baltierra and Patricio Perez Elorza. In the last 20 minutes of the first half, the Wreckers turned the tide and generated more offense. The Wave drew first blood less than two minutes into the second half when Connor Olson carried the ball into the right corner and sent a cross in front of the goal. Charlie Sears crashed through the box and drilled a shot past Cohen to put the Wave in front 1-0. “You only had to watch this game today to realize how much of a good player he is. It was a great finish,” Bradley said of Sears. The Wreckers drew even in the 63rd minute. Perez Elorza fed the ball to Vaughan Sealey in the midfield and Sealey sent a long ball ahead to Mauricio Inglada. Inglada got his foot on it for a shot around keeper Aaron Sears (7 saves), who ventured far out from the goal. Staples’ attack was relentless down the stretch, but Darien’s defense held on for the tie, forcing overtime. Neither team had any great chances in two 10-minute OT sessions, putting the game in PKs. Unlike their FCIAC semifinal loss to Trumbull, in which they lost on PKs 3-1, the Wreckers were on the mark this time, as Surya Balaji, Austin Sholes, Nick DiMasi, Eleftherios Pendarakis and Rob Diorio all scored. The Wave had successful PKs from Charlie Sears, Max Marcin, Will Henry Harmon and Olson, but the game ended when Pedro Calmon-Coelho put his shot over the top of the net. Speaking of confidence, the Wreckers feel they’re ready to make a deep run in the state playoffs.